I’m sitting in the living room watching the snow swirl and fall. We already have a fairly thick coating of the white stuff; winter arrived with a blustry vengeance this month. Like many entomologists, I tend to lament this time of year a wee bit. As much as I adore the crisp, stark beauty of the winter months, the season does not exactly create ideal conditions for my primary passion: finding, collecting and photographing six-leggers. Granted, many of my summer/fall finds are waiting for me in the freezer. I have hours and hours of enjoyable pinning, labeling and cataloging to look forward to; however, these thrills just don’t compare with the joys of discovering insects in their natural habitats. Imagine my surprise and delight, then, when a run-of-the-mill winter chore earlier this week resulted in a lovely beetle find AND a photo op! 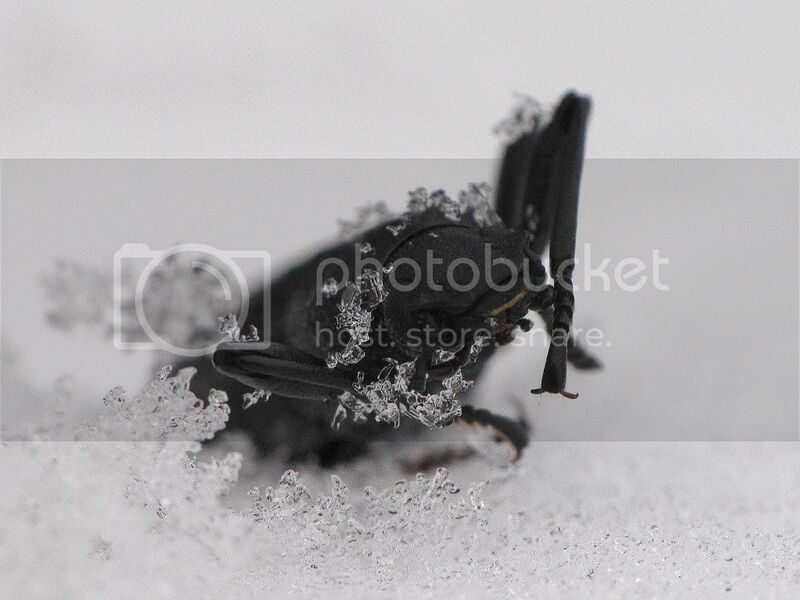 This frozen face belongs to Upis ceramboides, the Roughened Darkling Beetle (Tenebrionidae). 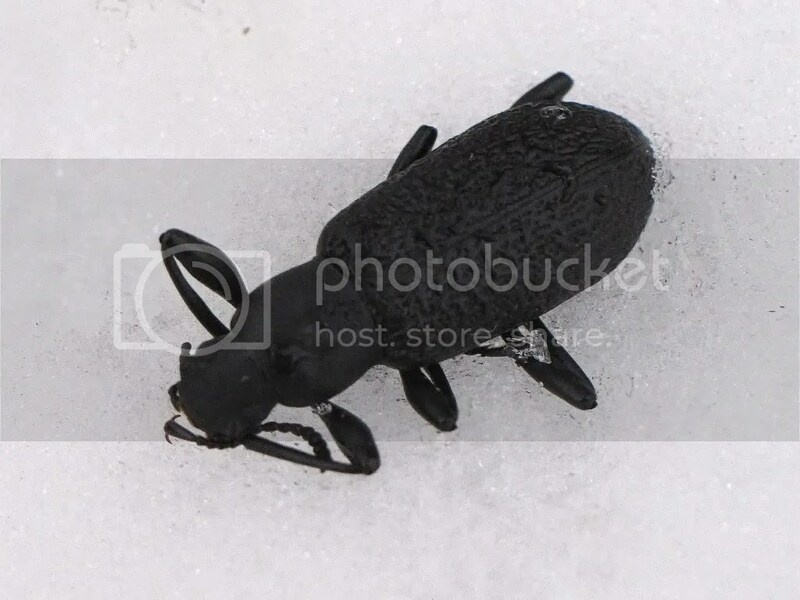 I was moving firewood from the shed to our alcove (we heat primarily with wood in the winter), when I saw the small black body of this beetle fall to the earth, where it lay in stark contrast to the snow. Darkling beetles are varied in their diets and habitats, but many can be found under bark or dead wood. Overwintering Upis adults have been extracted from decomposing spruce, birch and cottonwood; that I should find one amidst my wood pile is no surprise. This beetle has a fairly extensive northern range, so is well-adapted for cold weather survival. I was particularly smitten with the beautiful rugose elytra…the intricate folds and depressions add incredible depth of texture, especially juxtaposed against the perfectly smooth head and thorax. Kaufmann, T. (1969) Life history of Upis ceramboides at Fairbanks, Alaska. Ann. Ent. Soc. Amer. 62(4): 922-923. The elytra are crazy awesome! Smooth head, smooth thorax, then boom! The textured pattern is a great dichotomy, not to mention just totally cool. Glad to see that even in winter’s grip you’re finding goodies to hold you over until spring. I know you have all sorts of stuff waiting in the wings but I like the excitement of the unexpected that comes through here. I feel with you – I’m even cheered up by a Dermestes carnivorus marching out of a freshly opened dog treat jar. Not so much by all the larvae I found on closer inspection….I’m quite enchanted to see how much insect live is awake and well outdoors (Arizona) I’ll celebrate next night’s solistice lunar eclipse by putting out my black light. Just curious..
Great photos, and I feel your pain. I’ve been reduced to studio shots of posed, dead beetles! So this beetle was still alive? Wow – that’s impressive. 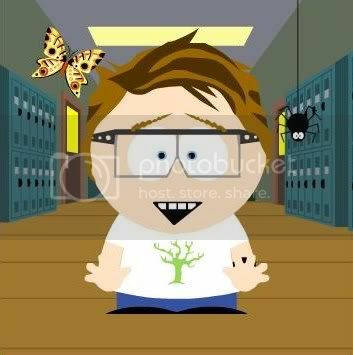 Glad you got your bug fix for the day. Alive and shut down, yep. I’m not sure if is freeze resistant or freeze tolerant, but it will stay in that state until it warms in the spring, then will “wake up” and emerge to mate. Great shots of beetle. Many of my firewood splitting sessions get sidetracked into photography sessions. LOL! It’s hard not to, what with so many excellent subjects!